A hacked Burger King Twitter account was “spectacular.” Burger King’s Twitter content is rarely spectacular, it’s mostly focused on pushing out content about their products. So when their account is hacked, and the content is expected to be spectacular, the audiences who seek that type of content come flooding over. The proactive solution, is for Burger King to elevate and diversify their content strategically, not ad hoc. Taking a look at the last 3 – 4 months of @BurgerKing’s activity you can see that they pretty much just push content out, mostly during the middle of the day, east coast time. So, when the account was hacked and the potential for this account to provide “spectacular” content, they attracted audiences who seek that thrill. 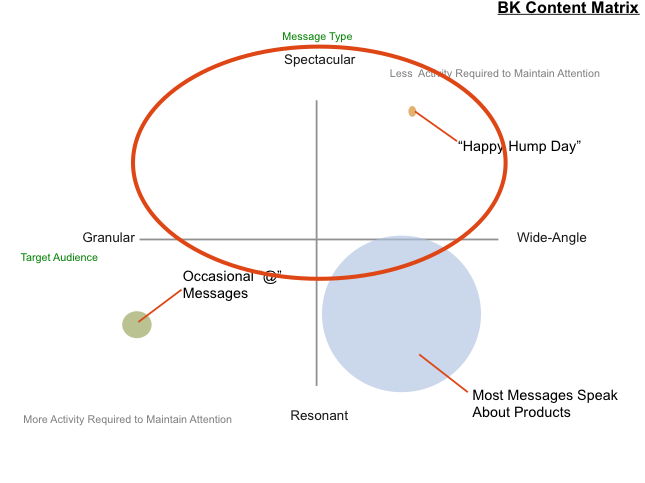 In short, there’s a content gap in Burger King’s content strategy. 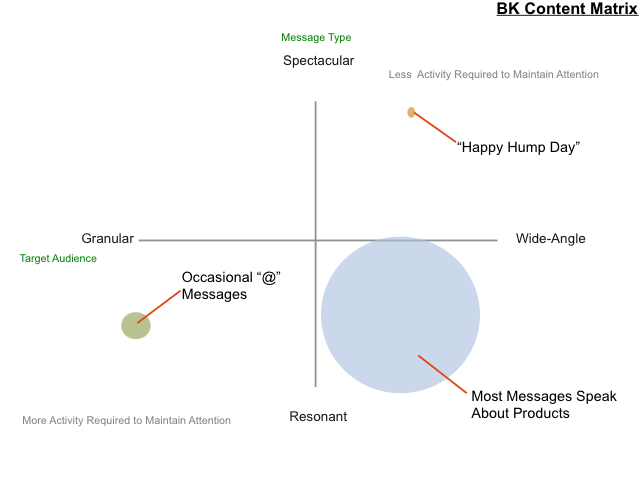 Since Burger King has not been actively engaged with more than half the content matrix, they are missing out on the opportunity to increase their engagement with their entire audiences. When the hackers stepped in and offered the possibility for spectacular content, they attracted this audience. Their opportunity now is to do something “spectacular” with this new audience.